Belgium is the heartland of cycling, especially cyclo-cross and much of the action is accessible to us Brit’s from the channel ports or the Eurotunnel. So I and Julian from London’s Cyclefit did so in 2008. It may be a running British joke to try to name a famous Belgian and although the country looks small and innocuous on the map; on greater inspection you soon find that things are a lot more interesting and there are indeed famous Belgians. Belgium does offer up a sombre feel and not just because of the legacy of warfare, but also because of the weather, which can be fickle and severe. Flanders soil has been hard to work for generations of Belgian farmers and the mud itself is seemingly hell bent on drawing humanity into it. Most of Belgium has seen development that has created a form of ‘urbanside’ – not quite countryside, nor totally urban. There are very few places where man hasn’t made an impact and really the only true wilderness is to be found in the Ardennes, which in turn has its own story to tell. Belgian’s do like their cycling and five minute’s ride from most houses is a cyclo-cross training circuit used by local and world class heroes alike. There are plenty of ride routes and some cover famous climbs from the Classic road races. The country may lack spectacular landscapes, but it makes up for it in rider challenges. We Brit’s have little understanding of how Belgium works; in short the country came about when Napoleon was beaten at Waterloo and the modern state was formed as a buffer created by the British between Catholic France and Protestant Netherlands. The language of government was French and the ruling elite spoke only that. Local differences were not indulged so when many Flandrian and other region’s farm boys went to war in 1914, few of them could understand rigid military French speak. Since then the country’s language, cultural and political rift between French and Flemish has led to the nation not having a functioning central government for a number of years, creating even more emphasis on local agencies. Many Flandrians will not visit French speaking Brussels on principle, or if they do, then it’s just to pick up people at the Eurotunnel. With the back-drop of war and political tensions, cycling in Belgium has grown into a sport followed with the passion equal to that of a top British football team. Top level races see huge crowds and even local races are awash with noise and atmosphere. Thus over the years many have beaten a path to Belgium to race to test themselves in the cauldron of cycle sport. Almost anywhere in Flanders is within an hour of the Tour of Flanders and Fleche Wallonne road races, and in addition there are smaller races such as GP Roeselare close at hand. Within this small area World Cup cyclo-cross and international races such as the Super Prestige Cross, are held. It’s no wonder that spectator friendly cyclo-cross is supported with huge zeal, enlivened with alcohol and frites consumption. The Superprestige cross held at Gavere on a military base, is one event that draws the crowds despite it not being as spectator friendly as other venues; what it loses in being able to freely move across the course, it makes up for by being tough offering plenty of spectacle. 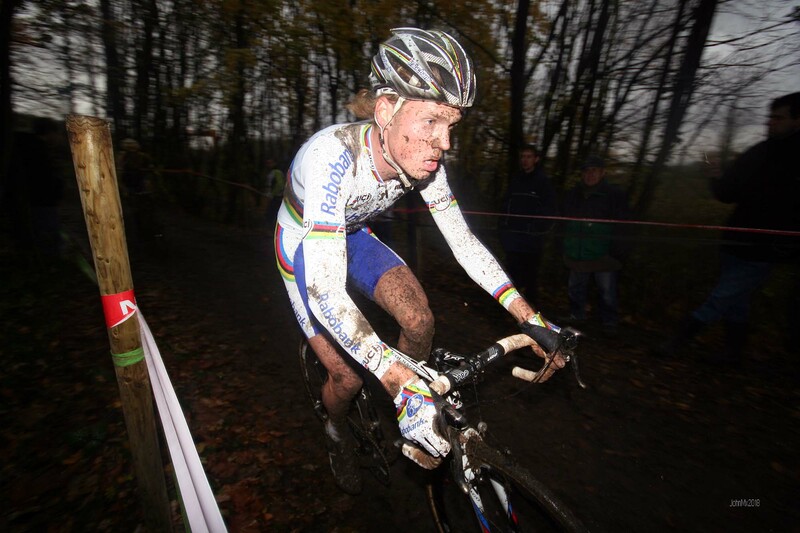 Sven Nys said of this race that it was ‘classic old time cyclo-cross and we would be foolish to disagree. The race is situated in a very dark wood with much of the course held on a hillside circulating a large country house. When we visited the race, rain had been falling steadily beforehand and the circuit had been turned into a morass of mud and blood curdling descents, turned insanely slippery. Stars such as Lars Boom have taken a big tumble there. It’s exciting and scary stuff, grist to the mill for the fans that whooped at any mishap and then exclaim with admiration at the skill involved. Niels Albert is another who has suffered at Gavere when he fell and damaged his spleen requiring a night in intensive care. We asked where the youth course was only to be told that they rode the same, and so it’s no surprise that so many grow into champions. As a spectator we slid and fell up and down the muddy banks, whilst being jostled by 1000’s of fans, short on manners but large on enthusiasm. We avoided the beer and ate at a few of the many stalls selling Frikadela’s (a sausage of sorts), hot dogs and frites. My biggest bit of advice to you is to be very English, learn a little Dutch (Flemish if you are a smarty pants), be polite and smile at everyone; the Belgian’s love it, in fact Brit’s and American’s are popular almost everywhere. Locals will respond to you in English and serve you with a smile, most probably fed up of the begrudging pleasantries of their normal clientele. A cynic might suggest that ‘cross racing in Belgium is just an excuse to drink beer, but not us – well, actually it almost is, as many end up dead drunk in the mud and others dance; yes, dance through the racing. It would do any young or even an established rider good to give it ago in the heartland of cycling; you may not win every race but you will dine out on the stories you will be able to tell about your time racing in Belgium. Top of the cyclo-cross tree are the UCI World Cups with a number being held in Belgium, next in the pecking order is the Superprestige Series and then bpost Bank Trophy; all feature the best of the world’s male and female cross riders. Not to be overlooked are many other events that attract good riders, events often associated with town celebrations. For the real cyclo-cross experience chooses one of these as this is where the Belgian’s tend to party the most.